Final preparations are underway for our Charity Colour Dash on Friday! We are delighted to have over 200 runners taking part as well as a number of volunteers and please find below final information for the event. All games kit and other belongings will be sent home on Thursday. Pupils are not required to wear uniform on Friday so should come to school in casual clothes suitable for the Colour Dash. This should include their white t-shirt and any neon merchandise purchased but please consider the forecast. You may wish to bring a change of clothes or towel for the car journey home. Remember, the colour powder looks most effective on light coloured clothing! A reminder that while the colour powder is not toxic, sunglasses are recommended to protect the eyes. If you are still to collect your merchandise order, the school shop will be open this Wednesday 2-3.30pm. Any orders not collected will be sent home on Thursday. With so many competitors we are providing extra car parking on the school site. We suggest arriving by 1.45pm if you are taking part and please follow the marshal’s instructions, who will be in high vis vests. Pupils may use the toilets in either the sports hall or swimming pool changing rooms. Please note that visitors cannot enter these areas. All visitors should use the disabled toilet in the pavilion or the disabled toilet located to the side of the pavilion closest to the car park. The Colour Festival will begin with a mass warm-up to music, led by our Year 8 Blue Set pupils. This will be located between the start and finish line, in front of the swimming pool. Following this there will a colour blast before the run begins and this should be a good photo opportunity. Following the mass warm-up, all 3km runners (Prep school) will be asked to make their way to the start line. Runners will be set off in waves but please feel free to run as fast as you are comfortable with. All 1km runners (pre-prep) will follow in the same fashion, alongside pre-prep staff. On crossing the finish line, all children will be given a creme egg. Pre-Prep pupils will then be escorted to the red gazebo where they will remain with Pre-Prep staff. Don't forget the excitement can continue and everyone is encouraged to stay and enjoy the 'Finish Festival'. There is a lot to look forward to once you have crossed that finish line! Enjoy the music, take the opportunity to get a Colour Dash photo behind our life size picture frame and replenish with a range of refreshments on offer. All monies raised will go towards our chosen Charity, the Toghill Ward at Nottingham Hospital. All refreshments and merchandise are £2 or less. All prep school children are free to leave once they have been signed out from the usual signing out desk. Year 1 & 2 pupils can be signed out with Mrs Wallis who will be located in the red gazebo by the swimming pool. All EYFS children will return to their classrooms with their teacher and must be collected from there. Sponsorship forms, along with cash, should be handed in to Mrs Sim in the school office by Friday 3rd May. Please ensure this is in a named envelope. A prize will be awarded to the highest fundraiser in EYFS, Year 1/2, Year 3/4, Year 5/6 and Year 7/8. 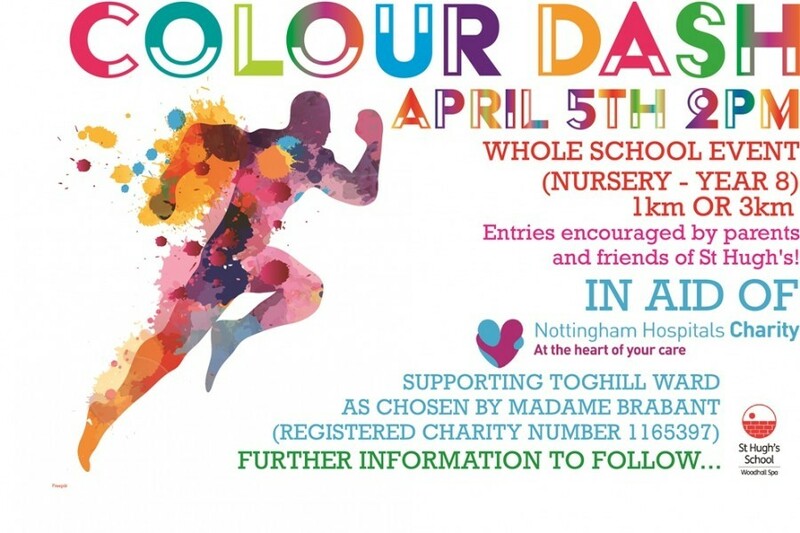 The Colour Dash is sure to be a fun filled afternoon which will bring us to the end of a very busy term!